Both veterans and under-resourced communities are top priorities. At New Orleans’ Recirculating Farms Coalition (RFC), vegetables grow in an intricate system of recirculating aquaculture systems and raised garden beds. Founded in 2009, the nonprofit organization trains urban farmers in both soil-based farming and fish farming—a combination that provides food for the local community. 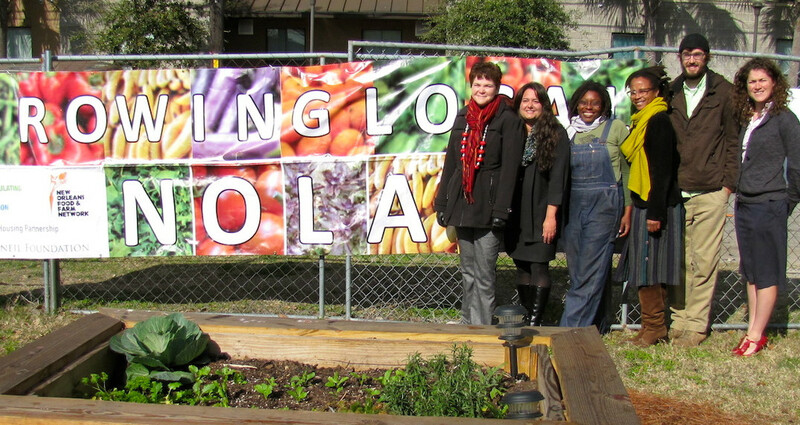 Now, thanks to a federal grant, RFC has received $500,000 to create a more robust free training program for budding urban farmers, specifically targeting its outreach and support to new farmers in some of the most low-income and underserved communities in New Orleans: Central City, Algiers, New Orleans East, the Seventh Ward, and the Ninth Ward. “Those five communities in particular have, over time, not had access to healthy, fresh food, and also badly need job creation, so that was our focus for the grant,” says Marianne Cufone, RFC’s executive director. Community members can grow their own food in garden plots and take free evening and weekend training courses at its half-acre community garden. That’s the same garden where U.S. Department of Agriculture’s (USDA) Deputy Secretary Krysta Harden made an appearance in early February to award RFC and announce 39 grants totaling more than $18 million in amounts ranging from roughly $70,000 to $1 million. The money for these new projects comes from the National Institute of Food and Agriculture’s (NIFA) Beginning Farmer and Rancher Development Program (BFRDP). Funded by the 2014 Farm Bill, the grants were awarded to whole range of university and nonprofit programs and networks providing education, mentoring, and technical assistance to new and early-career American farmers and ranchers. This isn’t the first time USDA has given funding to programs that help new farmers get started. But it is the largest amount to date, and has been viewed by many as one of few bright spots in the billion-dollar farm bill, which allocated the bulk of the money to food stamp recipients and large commodity farmers through subsidies like crop insurance. The BFRDP was first funded by the 2008 farm bill for $75 million over four years. The program was re-funded last year for $100 million to be doled out over five years, from 2014 through 2018. The idea is to provide support to those who are just entering the field or who have been farming or ranching for less than 10 years. Congress mandated that at least 5 percent of the total BFRDP grant money be given to programs that target socially disadvantaged or farmers and ranchers with limited resources. The 2014 farm bill added the additional stipulation that another 5 percent of the total funding be awarded to programs that support military veterans who want to get into farming or ranching. “In the grants that were just announced, we exceeded both of those requirements,” says Jill Auburn, NIFA’s national program leader, estimating that about half of the funding dollars were awarded to programs focused on working with new farmers from socially disadvantaged or limited-resource backgrounds and roughly 8 percent to new military-veteran farmers. The awardees, says Auburn, “are as diverse as American agriculture is,” and include programs housed at large research universities such as the University of Minnesota, the University of California at Berkeley, and Cornell University, as well as nonprofit community- and region-based enterprises, such as the Stone Barns Center for Food and Agriculture in New York, the Tyonek Tribal Conservation District in Alaska, and Community Crops in Nebraska. Some of the 2014 grants are renewals of previous awards, including one that went to the University of Arkansas Division of Agriculture, which provides education and mentoring for minority farmers and military veterans interested in raising poultry, sheep, and goats. Annie Donoghue helps run the program along with her husband and project director, Dan Donoghue, and seven other partner organizations, which include USDA’s Agricultural Research Service in Fayetteville, Arkansas, the Farmer Veteran Coalition, the University of Missouri, and the National Center for Appropriate Technology. Arkansas’ program offers free online courses in both English and Spanish, as well as hands-on, in-person public trainings and Armed to Farm boot camps for veterans, where participants learn the basics of poultry production, skills such as poultry-house building and even how to find appropriate markets for their businesses. Since its inception about seven years ago, the program’s online courses have had more than 28,000 hits—including from some Spanish-speaking locales outside of the U.S.—and roughly 350 military veterans have used their tools or attended classes. And with grant renewal, it has the potential to make an even larger impact. In fact, when Marianne Cufone of Recirculating Farms Coalition thinks about how much more her organization will now be able to do, she starts to wax a little patriotic. “This is just an incredible opportunity to do something great for agriculture, for the communities, and for our country,” she says. The Beginning Farmer and Rancher Development Program is accepting applications for the 2015 grant cycle until March 13, 2015. To receive announcements about webinars and other information, follow NIFA on Twitter. There’s more information about support for new farmers and ranchers on the USDA’s website. Funny. When my relatives and ancestors had farms they didn't need the government to start them. Back when your relatives wanted to farm land wasn't ten thousand dollars an acre either. Land prices have skyrocketed, and even though it's getting better, people understood the quality of paying a decent price for their food. Brian Gooch, that's because they grew up on farms and didn't need training.